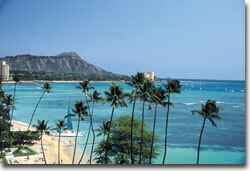 The first surprise of our recent trip was that Hawaii is once again hot, hot, hot. Hotels, resorts, and villas were booked; seats on flights were scarce. Tourism is on the rise. My assessment of our island-hopping holiday was the second surprise: We had a great time! Hawaii is beautiful, and in many parts, simply spectacular. Sure, it's still crowded, but it's not hard to find wide-open spaces and deserted beaches, especially if you venture to the less-visited islands. It's probably more commercial than ever, but if you get beyond Waikiki's 30,000 hotel rooms, you'll discover upscale "tentalows," plantation cottages, and remote beach houses. There's something for everyone—from golfers and surfers to shoppers and lounge lizards. And while the hula-lei-ukulele-luau circuit has a high schmaltz quotient, the best attractions give you insight into the history of these Hawaiian icons. Maybe I was enamored because I was seeing Hawaii through Gail's eyes; she'd never been to the islands and had visions of golden beaches, swaying palms, hula skirts, tropical flowers, and romantic movie sets. Or maybe it was because we mixed first-timer activities with things I'd longed to do on earlier trips, but never had time for. Or maybe it was because Hawaii simply worked its magic . . .